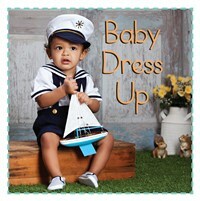 From a cuddly lion to a perfect pumpkin you will struggle to choose a favorite among the babies adorably dressed up in this sweet board book. Filled with bright and beautiful photographs that will capture the attention of children of all ages. The Baby Firsts series from Flowerpot Press is the perfect introduction to books for even the youngest of children. Each book features lots of friendly faces that draw baby's attention and build their love for, and familiarity with, books—hopefully planting the seeds that last a lifetime!